Let’s not spread conspiracy theories. But there are troubling signs about the latest anti-EV op-ed. “Electric vehicle subsidies don’t help the environment.” That’s the headline of an opinion piece you might have seen recently in your local paper. The piece by Drew Johnson first appeared in the Austin American-Statesman a month ago. Johnson’s article keeps showing up in local papers – from Montrose, Colo. to Houma, La. That’s because the Austin American-Statesman was purchased by GateHouse Media in 2018. The Pittsford, NY-company now publishes 145 daily newspapers, 325 community publications and more than 555 local market websites that reach more than 23 million people each week. GateHouse’s influence reaches 37 states. EVs don’t help the environment much. Although they produce zero emissions once on the road, battery production for a single EV can emit up to 17.5 metric tons of carbon dioxide. That’s equivalent to the CO2 emissions released from over 1,900 gallons of gasoline. When EVs are charged with electricity generated at dirty coal-fired power plants, they can actually produce more total emissions than certain gasoline-powered cars. In other words, EVs don’t necessarily eliminate carbon pollution — they just shift the source of those emissions from the tailpipe to the power plant. Between 2018 and 2050, EVs will achieve a net CO2 emissions reduction of just “one-half of one percent of total forecast U.S. energy-related carbon emissions,” according to economic consultant Jonathan Lesser, author of a recent EV report published by the Manhattan Institute. Planisamy said that this was partially true in the past when most of the power generated in the US came from coal-powered plants. “This scenario has changed dramatically and quickly,” he explained pointing to this graph from the Financial Times. Bloomberg comes to the same conclusion. Earlier this month, the media company reported a story, “Electric Cars Are Cleaner Even When Powered by Coal.” Moreover, according to Bloomberg, electric cars will become cleaner in the coming years as utilities close coal plants and draw more energy from wind and solar farms. “When an internal combustion vehicle rolls off the line its emissions per kilometer are set, but for an EV they keep falling every year as the grid gets cleaner,” said Colin McKerracher, a transport analyst at Bloomberg New Energy Finance. As with any news these days, it’s critical to consider the source. Johnson is the founder and first president of the Tennessee Center for Policy Research, now known as the Beacon Center of Tennessee. The center previously ran a website called “Carnival of Climate Change.” Johnson is also credited with revealing in 2007 that Al Gore’s Tennessee mansion used roughly 20 times more energy than the typical American household. Johnson previously served as a Koch Fellow at the Institute for Humane Studies and the American Enterprise Institute, both funded by foundations tied to Koch Industries. GateHouse Media has a mixed record on reporting about climate change. In August 2018, GateHouse published a balanced assessment of how rising seas in Florida had become undeniable, thus affecting the state’s citizen and politics. Earlier this month, the North Carolina’s Fayetteville Observer, a GateHouse Media property, published an opinion piece explaining how the fossil-fuel industry wages climate-denial campaigns. 86 Comments on "Columnist Repeats Bogus Claim That Electric Cars Aren’t Green"
Wow, France is really doing a great job on their grid related emissions. I wonder what they could be doing to keep carbon emissions so low? Indeed. IN 2017 71% came from nuclear energy. Hydro at 10.1% wind was 4,5% and coal less than that. So they do some things good. And nuclear isn’t that scary. But it’s just costly. Sounds good. I’ll let the DOE know they can put a few million tons of nuclear waste we currently have no place for in your basement. Thanks bro. France actually does great with reprocessing their nuclear fuel for reuse. Very little waste. It’s too bad that fear and over-regulation killed nuclear in the US. Modern reactor designs are incredibly safe, but people still think they’re all like Chernobyl. France has solved the problem of nuclear waste. Sorry you (along with the mass media) didn’t get the memo. “Bataille’s law specifies 2006 as the year in which parliament must decide which laboratory will become the national stocking center” It talks about 2006 as the future. What year was this article written in? No indication. This also does not say that “France has solved the problem of nuclear waste.” It says they intended at the time to build labs to work on it. In fact…no they don’t. I was raised in France and followed very closely the Nuclear debate there. They had a lot of problems, and not only financially speaking. They still don’t know where to put the most dangerous waste. And the “best” part is yet to come with the decommissioning of more and more nuclear plants built in the 70’s and 80’s, some before their final life expediency because of severe defects in several reactors vessels. And some have been built in seismic areas or are very sensible to flooding which could result in Fukushima like accidents. All in that, the decommissioning of each nuclear plants will cost almost the same that their construction! Its only because tax payer money is going heavily to compensate all the hurdles that the nuclear is still viable in France, at least in its actual form. It is because of that they decided to substitute at least half of their nuclear plants by renewable energy in the next 15 years. Not in anybody’s basement but yes in a basement. Put it in a cavern and watch it. We need about 100 years of fission power. We need to survive the next 100 years: it will be rough. 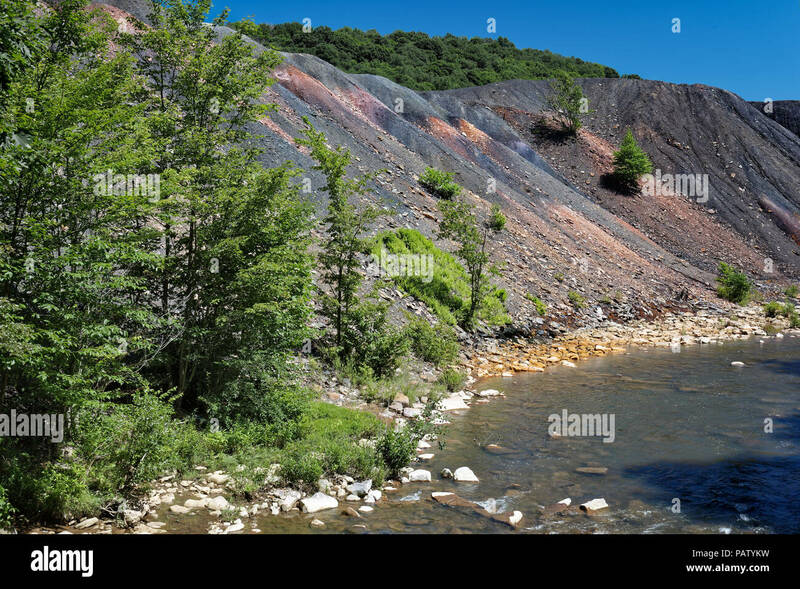 What are people doing with the much larger mass of toxic coal tailings with infinite half-lives? Nothing. As it turns out, France is the only country with a near zero carbon electrical grid. People praise Germany blah blah blah but they ‘re still behind. Once fossil fuel use, including gas, is zero: then let renewables take over nuclear. Until then, we need maximum effort on both. Time to butch up about fission. This is a civilizational extinction event. Wrong. See Iceland, Sweden, Finland, Paraguay, etc. Most countries just don’t have the hydro capability that those countries have, Sanoj. The US is destroying dams to allow for fish to get to lost spawning streams, so our hydro was static for 30 year but is actually going down slightly over the past couple years. But in the past 60 years the US has gone from getting 30% of its electricity from hydro to just 6%. As opposed to few trillion metric tons of carbon dioxide and other toxic gases into the atmosphere for our children to inhale on daily basis, including stuff like sulfur dioxide, carbon monoxides, arsenics and cyanides? At least radioactive waste can be refined and diluted until it’s usable in medical and commercial applications, and it’s bot like there is a shortage of desert wastelands to be used for their storage until a better solution is found, which can’t be said about exhaust gases, can’t dilute the atmosphere or a class-5 hurricane coming at a coastline in 4-5 days time. Have a look at how much pollution comes out out of a single container cargo ship or cruise ship, and u will look at thing a bit differently. Nuclear is far less scary than the average person makes it out to be, but it is so costly that it really worth discussing. The money spent on a couple plants could easily upgrade grids and install huge amounts of wind and solar. And while nuclear isn’t the boogieman some want it to be, the fact that it does have risks and pollution that wind and solar don’t isnt a big help. Just because we put radioactive waste somewhere away in a field or in some underground cave doesn’t mean problem is solved or that these indirect costs are not part of the total cost of operation equation. So we should solve the problem with next generation reactors that uses that so called “waste” as fuel instead… 😉 Free fuel for thousands of years. They keep talking about it for some time now, it would be nice to finally happen…and even from these you would still have waste. Let’s solve the problem by just inventing something cheaper and cleaner….like wind, solar and storage. Pumped hydro / tidal is also a good to add to the mix. It’s bizarre how commercial nuclear power is the only industry where any toxic waste at all, even when it’s relatively a very small amount, is deemed “unacceptable”. 1. The amount of waste produced by nuclear power plants is extremely tiny when compared to fossil-fuel power plants. Orders of magnitude smaller volume. 2. About 90% of the waste from nuclear power plants can be recycled, as France does. 3. The remaining 10% which can’t be recycled, can be dispersed into tiny particles embedded in glass blocks, where it will remain stable indefinitely… as the French also do. The only problem with nuclear waste is a political one, not a technical one. It’s a tricky subject….let’s ask Cernobyl residents how long it took them to clean it up…wait, never mind. You see, people are jumpy when it comes to nuclear because it’s one of the few industries that will make people move out of a wast area for the next 1000 years. Evan the waste collection sites will never be inhabited ever again. I cringe when people say this is a cheap form of energy. Include disposal and waste storage in the prices and let’s see how cheap it really is. It’s turning an enormous problem into a small problem. I read in France we have the project to close 4 to 6 nuclear plants by 2028, replacing them renewables. France uses a lot of nuclear power, zero CO2! 9.1% of their electricity generation is thermal and does produce CO2. Also they have a lot of fossil use in home heating and other places, and a high concentration of diesel vehicles. But fortunately, France still gets the majority of its grid power from existing nuclear power plants. Many Germans and also other people have a great fear when it comes to nuclear power because there are a few very old nuclear reactors in Belgium and France that constantly have minor or bigger emergency shutdowns. After over 40 years some of those reactors are not in a very good condition anymore. If something happens it could be disastrous. But they’re still not shutting them down. And as we know with nuclear reactors. All catastrophes are caused by human error. And they’re not very transparent when it comes to reporting incidents. They’re to confident in letting them run. Hopefully nothing happens. But there’s a big IF as always with nuclear. Which means they lost know how on how to build that stuff again, and now all such projects are way over budget and way over time. National Center for Public Policy Research. That is all you have to know about the agenda behind that op-ed. No doubt they are loyal foot soldiers in the Koch Heads campaign against all things sustainable including EVs and RE. while extolling the virtues of fossil fuels.. It makes some pretty untenable assumptions about EVs, IMHO. Look at the Reference Case assumptions for EVs on p. 127: They don’t have U.S. BEV sales hitting 1M until almost 2030, but with current growth rates, that will happen in 2020 or 2021. They have gasoline-powered light vehicles retaining ~70% market share until 2050! EIA has a terrific record for underestimating EVs. You don’t suppose the people working there come from the oil industry, do you? I can’t make a gallon of gasoline from some panels on my roof or windmill in the yard. I can’t even search for raw crude if I wanted to. Sure, but what does that have to do with the point being made? Currently the vast majority cannot make their own electricity either, however most people have access to a renewable electricity provider that they can sign up to. That’s right. You also can’t fly just by thinking happy thoughts. So what? Also, a windmill is good for milling grain but a wind turbine is what you want for electricity. China has a big problem and is not CO2. They are making the ev push so they can see the sky again, for crying out loud! These places in US that you talk about have very low numbers of evs anyway so they really don’t matter in this discussion. A state that wants to go green tends to do it on all fronts. Presumably we want those places to increase the number of EV’s? Or should they just continue driving around with ICE vehicles? They are very relevant to the discussion, however – and this is one of the points missed by all the commentators and downvoters so far- people need to realise this is the case, or it’s not going to help anyone. People also need to realise that those locations aren’t the norm – and that is the main issue with the article, while they put those identifiers in there (“can” and “necessarily”) it doesn’t quantify the reality. If you’re driving an EV for environmental reasons then this is an important discussion to have, and rather than just brush it under the carpet there should be a rational discussion about it. That discussion will help in the long run – as I’ve said so many times now, not least because people may decide to switch to renewable energy overall, rather than stick with an especially dirty grid. You are making some assumptions on your posts that get you the downs. That “especially dirty grid” in US is not really an actuality…the very few remaining states that eat coal for lunch are turning to nat gas fast. The other big assumption you make is that the other side wants to actually debate with facts all of this ev and green energy push. Not my observation. That’s fine, but again irrelevant to the point I was making. I’m not talking about the average American, i’m talking specifically about specific sections of the the world (you can include specific parts of the US in this) where the power grid is especially dirty. I suspect people are not actually reading the post properly (as expected) and just blanket assuming I’m advocating EV’s aren’t generally greener. As an example, have a look at the GHG emissions of Alberta’s power grid. It’s bad enough that the break even point of like for like vehicles is in the region of a full size/superduty pickup truck – a segment that isn’t available in BEV form yet. Now, hopefully that will change in the future, BUT for those that want an EV and live in areas of the Canada/US/world that have such a bad energy grid I suggest you voice your opinion with your wallet – get solar if you can afford it, alternatively get on a renewable tariff. That way your money goes directly towards reducing pollution from your local power grid and helps further renewable electricity generation. To go further into what I’m talking about here is a link to a map of Canada’s electricity grid emissions per province. Canada as a whole emits around 150g CO2 per kWh, however that varies from 1kWh in Quebec where hydroelectric is the main provider of electricity, to 790g in Alberta. There are major variations in most larger countries (including the US). That means that while in most locations in a country it would be “greener” to drive an EV, in other parts it is not. If you live in one of those parts of your country then you should realise that buying an EV isn’t going to do anything environmentally in the short term, unless you consider where your energy is coming from, and how much CO2 is being generated. And just to drive the point home – if you do live in one of those parts then spend a little more and a renewable electricity tariff, meaning your EV will actually help reduce CO2 production. Whether or not you are correct depends on what pollution you are talking about. If you are talking about sulfur, particulate, nitrogen, ect, then yes, coal is more polluting. But that is not the pollutant that most here are concerned about. CO2 presents such a broad based threat that it is an overriding concern. On that basis, no coal in the US plant will emit more CO2 to power an EV than the most efficient ICE will produce. Well let’s see… the Union of Concerned Scientists says the “long tailpipe” myth is exactly that — a myth. And they show both figures and a map (see below) to prove it. Contrariwise, some random guy on the internet who calls himself “Andy” says it’s true. Is that the latest? I thought they updated this map and it was even better now? I was just looking for that…. Thanks. Yes, it has gotten better, and that is based on 2016 power plant data. Even RMPA and SPNO managed to jump from 35 MPG equivalent to 46 MPG equivalent. And some of the states in those regions have been building solar and wind like crazy. The real one is the blue one which uses the data from the average EV in USA. The blue chart is outdated, and just an fyi it isn’t average either but weighed average by sales. With Tesla Model 3 being #1 and Prius Prime being #2. Your weighed average wouldn’t look that different. And let’s not forget, this is only about CO2…and CO2 with water vapor are probably the least harmful compounds that come out of the tailpipes. Repeating the EV-hater “long tailpipe” myth doesn’t make it any more true, no matter how many times you repeat it. We don’t get to vote on scientific fact, and it’s not mere opinion. It’s either true or it’s false. What you’re saying is false for every single region of the U.S., and I seriously question it’s true anywhere. ….and over 40% of EV owners in CA also have solar power. That was from a 2016 survey. Both solar and EVs have grown significantly since then. Half of EVs sold in the US are in California. In CA about half of EVs are in Northern California where we get 0% of our electricity from coal. Statewide we get 4.1% from coal with that dropping below 2% later this year and to 0.5% 2 years after that. By 2024 coal will provide 0% of our electricity. That’s by law and with only three contracts remaining it is a done deal. NG, which was over60% just a few years ago, is dropping like a rock. In 2017 I believe it was about 33%. I haven’t seen numbers for 2018 yet but fossil fuels continued to decline. It’s amazing that the EV-hater crowd is still getting mileage out of the tired old “long tailpipe” myth about EVs. 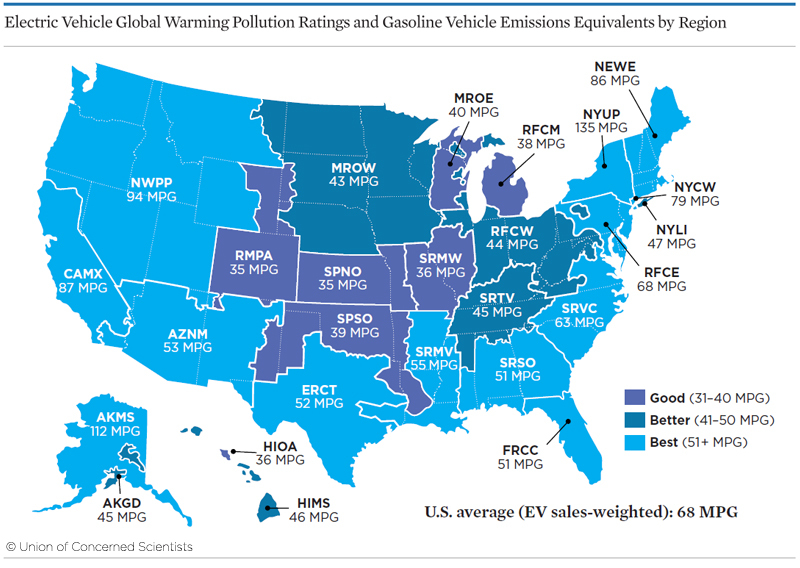 The Union of Concerned Scientists says that even in places where grid power comes mostly from coal, it’s still cleaner (on the basis of greenhouse gas emissions) to drive a BEV than a gasmobile, when comparing cars of similar power in their motors. Now, if you compare a tiny fuel-efficient gasmobile to a honkin’ big luxury BEV, then yeah, the gasmobile is better for GHG emissions in areas where the grid is particularly dirty. But you have to get very, very far away from a true apples-to-apples comparison before you can find even a cherry-picked case where it’s not cleaner, over the expected lifetime of a car, to drive a BEV. That is from 2015 and it is possible their data on regional grids is older. Regardless energy grids in the US have been getting significantly cleaner. Both ERCT and SPSO have added significant amounts of wind power in thelast4 years. Even under Vlad’s minion’s auspices coal plants are closing at record pace in the US. According to those charts, there is no place where an EV isn’t cleaner than an ICE, even China. The grey line for the Average ICE is always higher than EVs. Actually, the latest data shows even in China where their coal isn’t as clean and beautiful as ours, EVs are less polluting than ICE vehicles. Granted, in many cases only slightly less. However, no other country in the world is pushing harder to move away from coal. If all ICE vehicles could maintain the emissions level they have when brand new throughout their life they might have a stronger case. But, with the average age of an automobile in the US now north of 11 years there are lots of out of tune ICE vehicles polluting our air. Personally I am far more concerned about the toxic emissions of old out of tune ICE vehicles than lifetime CO2 emissions. Yup. When I took Environmental Science in college back in the mid-seventies, the professor said that 10% of vehicles on the road emitted 90% of the pollution. Of course that was back before everyone was focused on CO2, but for actual pollution — toxic gases, carcinogens and the like, and not mere CO2 — I think that’s probably still the case, for gasmobiles and diesel trucks. If you look at the cars and trucks which have visible exhaust, visible because it’s so dirty, nearly all of those vehicles are older ones. They are cars, they are not green by default. At best they are not as bad as combustion cars. You don’t need to be a genius to figure out that your tyres end up as plastic pollution. Except for the parts you actually burn. So even if we would end up having the whole production and recycling as well as the fuelling on renewable energy they are still cars polluting the environment. If you want to stop pollution completely then eliminate everyone. The goal here is to reduce pollution… which gets harder to do with an ever growing world population. Exactly. If we can halve the GHG impact from cradle to grave of each vehicle we produce going forward and don’t double our population we at least have reduced our impact overall from today’s numbers in the light transportation sector. That’s going in the right direction at least. The alternative of punting and doing nothing is a crappy option. Actually we need to figure out ways of replacing the polymers we use with variants that will break down or mineralise. But to achieve this we first have to acknowledge that it is an issue that needs to be dealt with. The claim that EVs are somehow green is just ridiculous. They are simply less bad. “less bad” is called “better”. Use it. The misinformation is not going to change anything. Going green is now cheaper than going dirty. The Train has left the station. Get ready to enjoy the cleaner air. In Los Angeles County four million people living in unincorporated areas can now purchase 100 percent renewable and have it delivered through SCE. It’s the result of California’s Community Choice Aggregation Law. By March the 25k miles per year I put on my Bolt will not be from fossil fuels. I just signed up for sce’s 100% green rate. Only 1,000 households signed up. For those without access to community choice. My area in N.Cal has similar options. My 100% renewable/carbon neutral power costs a mere 2% more than the standard PG&E power. That’s $3 on my $150 power bill. TOTALLY worth it! Not everyone has that option, but you’d be surprised what is available to you if you research it. To be entirely fair the renewable ought to be priced including 24 hour storage for baseloads, but the direction is clear. If aqueous sulfur flow batteries ever work and get cheap, it will be over for most everything else. You don’t need 24 hour storage for base load. 2-6 hours is considered more than enough. The concept of baseload is pretty flawed, that is how the grid was in the past. But a smart grid doesn’t need baseload. But even then, LION battery prices have dropped 6X in the past 8 years. So storage is getting cheaper rapidly too. Ever notice that certain folks only refer to “dirty coal” when it is being used to charge an EV? And that all the rest of the time they call it “Clean Coal”? It is amazing at how fast that coal gets “clean” the instant it isn’t being used to charge an EV. Glad he identified exactly what needs to be cleaned up. It is not the EV…. I’m surprised he doesn’t know they are using clean coal…it’s what the pres said. Honestly, I don’t care. I am saving money and it is legal. If it was that bad, the government won’t allow these things on the road. While the part about EVs drawing energy from the grid and battery production was part of the article, the main point was that taxes are being used to subsidize the rich when they buy expensive luxury EVs like Teslas. And that main point, while briefly mentioned in the InsideEV piece, seems like a very sound and logical conclusion based on the numbers he cites that 80% of EV buyers make over 100k per year. Valid point, however $100k per year is misleading. To the average Joe, that is high. In my area, where EVs are numerous, $100k income leaves you in the poor house. Your point would be valid if Tesla was to only ev manufacturer….they are not…so you don’t have a point. You don’t have to be rich to buy or lease a $30k car.